Creates a table of contents from heading in the current page and inserts at the top of the page. Optionally it adds "Back to Top" links to the headings. Fixed an issue where the "Back to Top" links wouldn't be updated if they already exist. Also the macro will now remember the "Back to Top" setting. Updated to refresh the TOC in the current page if it already exists. Now finds all the headers in the page, even if they are in a table. Re-added the option for "Back to Top" links, which was lost in the previous update. Added the option for "Back to Top" links. I'm having an issue with this macro I love the idea of being able to create a table of contents within the page. However, when I run the macro it changes all the font colors to a lighter color. I believe it might an issue as I use the black theme macro on all pages with white text ofc. Don't know if I'm doing something wrong and I could prevent this happening. please comment if anyone has figured out a solution to this problem. Thanks for creating this for individuals and organized their notebooks! THANK YOU. The TOC functionality is great! My font will become very small when I use it,and the font is chinese.I tried to look at the code and found that I could not find the syntax related to this situation.Maybe it only has problems with Chinese? Tried it once and it worked beautifully!! Tried again on same page, new page, deleted entire notebook and tried again, different type of page etc... didn't work every again. Joseph: It looks like this is a bug in the web version of OneNote. I will report to them. sullivan.andrew: Unfortunately currently macros cannot create list numbers. Really appreciate your work. Is there any way that the TOC could include list numbers? Awesome tool! If possible, could these links be modified to work in the web version of OneNote as well? Hi, I love this feature. Could you also make the link clickable in OneNote Web? The TOC is being generated but none of the link actually work. Is there an issue on my end? Nate Kaemingk: Updated the macro to fix this issue. You should be able to just run the macro again and it will update the Back to Top links. Links get broken when the page copied in OneNote, there is no way around it. EA5512 has a slight bug with relative vs absolute links. If I copy the notebook over to a new page all of the links go back to the original page, not the page I'm on. This can be fixed by re-running the macro... but unfortunately the macro doesn't refresh the "Back to Top" links even if the TOC content was updated to work for the page it's on. All of the "back to top" links still go to the original page. So the true fix is to run this twice, once with "back to top" unchecked to delete all of the "back to top" links, then again with "back to top" option checked which rebuilds. I should not have to jump through this many hoops to copy a page with a page specific TOC. This macro definitely adds great value to the OneNote. Update with two suggestions as mentioned by "AJ - 2017-09-26" would be great and ease working on documents which are long and undergo frequent updates. Very useful! It would be great if this could also use the custom styles . I am slowly falling in love with this. The ToC is great. Since, I find myself deleting and then recreating the ToC a fair bit on the pages that I am actively working on. On some pages the TOC can't be created. An error "The ink can't be inserted" occurs. Can't figure out the reason. Already deleted all formats before defining the headers which do not contain ink/handwriting. Is it possible to create TOC at the top of the page using tags instead of headings? Or is it possible to find/replace a specific tag with a heading? Or, find/replace a specific word with a heading? When I'm typing during class it is too hard to click CTRL-ALT-1 or CTRL-ALT-2 and yet I need a TOC at the top of each page so I can quickly scan pages to find information. Right now I type ttt1 or ttt2 and then use your "search & tag" to replace with a TOC1 or TOC2 tag. However, I can't get those to the top of the page to create a TOC because "tag summary for specific tag" only works at the section level. Please add the logic to auto-update or even manually update the TOC. Its not there right now!! Thanks Omer. It is so nice to see such prompt reply to queries here. Great Job. Prep: You need to use the built-in heading styles named Heading 1 through Heading 6 from the ribbon. I am new to Macros. I downloaded Onetastic and m able to use one calendar.I dont know how to use TOC. Can anyone provide a link /info on how to use it ? I created a headlines with # and Subheadlines with ## but that doesnt seem to create TOC after I hit TOC tab on my ribbon. OK, thanks Omer, I understand. The regenration is a pain when it concerns a lot of pages, but I'll have to live with that. BTW, do you know if Microsoft intends to fix the bug you mentioned? PeterB: This is a OneNote bug, so can't be fixed on Onetastic side. You would need to regenerate the TOC after moving . I just moved a section from 1 notebook to another notebook. Each page in the original section had a "TOC in Current Page". But after the move the links do not work anymore !! With a different section I tried copying to another notebook to see if that would make any difference, but not so. So whether you move or copy a section with its pages to another notebook destroys the "TOC in Current Page" links. Thanks for your tool, it saved my huge amount of time. However, as I usually add more information in the same page, is it possible to add a function to update the TOC? Currently, if I launch the tool in the second time, it will only add one more TOC on the top of page. You trully are a good guy! I had 50 headings 1 in one page - that really upset me when I had to do it manually one by one. which is valid because string "3" can be implicitly converted to numeric type of value 3. In your case you probably don't need to set the indent for the TOC entry if you don't have any heading levels. It said operand requires a "-"
Dan: This macro checks $Paragraph.style to see if it starts with "h". Heading styles are h1 through h6. You could probably change that to check if $Paragraph.text contains # instead. I use the \"TOC in current page\" with the Onetastic 3.2.2.
menace97: Can you send a copy of your page to support@getonetastic.com? I have tried this macro in multiple situations and cannot get any result to occur, i.e. nothing happens. Clicking the "Add (Back to Top) link" check box doesn't add a link either. I have reinstalled the macro also. Create a directory each time, will not cover the original directory.This can be perfect? Also, I'd like to add a point in front of the directory. But I don't know how to set up. My English is very poor, it is the result of machine translation.Please forgive me. "Yes, I have not changed anything, neither to the headings nor to the rest of the pages. Could I send you a copy of such a page?" Yes, I have not changed anything, neither to the headings nor to the rest of the pages. Could I send you a copy of such a page? I am not sure, I cannot reproduce this behavior. Are the headings still using heading styles? Omer, any suggestion re my last mail of 25 Aug? I installed the new version on 15 Aug, and find now that when I delete an old TOC from a page, and want to run the new macro on that same page, it does not work i.e. nothing happens. It does work when I create a totally new page. Like this really useful macro a lot! Meanwhile looks like when it got upgraded now level 3 and above headings get treated as level 2. How does one get all headings like before? Paranam Kid: I just updated the macro to add the option for "Back to Top" links. Please re-download the latest version of the macro. Omer, the new version of this macro does not seem to offer the possibility anymore for a "Back to top" link. Is that correct? I found it very useful. Omer Atay: Thank you very much. I update the lastest version of Onetastic, and it works! You are a very good man. wheeling: You don't seem to have the latest version of Onetastic. It should have told you while installing the macro that this macro is for a newer version of Onetastic. Please download the latest version. A property named 'paragraphs' on object of type 'Outline' does not exit. Thank you for your fast response! I checked as you described, and I found the Version 2.18.4 ! It might have to do with the admin-rights on this Computer. I'll re-check and give you a Feedback. Bernhard: You can check the version by going to Tools > Options > Addins then note the path of Onetastic.dll. Then find the file and right click on it, then go to Details tab and find the version. I will add an easier way to find the version number. It is possible that you installed the wrong bitness (32 vs 64 bit) and the older version is still being loaded. After download and doubleclick, it tells me that "this macro is for a newer Version of Onetastic..." although i have the latest Version "Current version: 3.1.1 July 31, 2016" downloaded and it seemed it was installed. Where can i check the version which is installed? janp: This is due to the way indents work. This macro currently doesn't handle indented headings properly. It will see the indented one before the parent one. Probably an update to the macro language is needed to fix this. Ivan, there was a bug in the macro. I just updated it. Please re-download the macro and give it a try. Installed version 3.0 of Onetastic. Now the TOC in Current Page does not indent based on Style formatted headings. Every line of the TOC is at the same level. janp: I tried with a page with 2000 headings (all of them heading 1), and I didn't hit the error. There must be something else going on with the page. Indentations, headings in tables etc. If you can share a page that hits the problem, I can look into it. Re: "The XML is invalid"
This only happens, when there are too many headings in the page. But can this be fixed? I often have many headings in texts and would appreciate the macro to be capable of managing that. Update to my previous post...as a quick workaround, I found that I can apply one of the OOTB Styles first, then apply the Custom Style for desired formatting. This only appears to support the built-in Styles? Would be nice to also support the Onetastic Custom Styles. I am finding that the TOC entries are being printed in the wrong order. Specifically, Heading 1 entries are transposed' down the TOC to where the next Heading 1 entry should be! I am using OneNote 2016. I get the message "The XML is invalid" when trying to create a TOC in Current Page. TOC = Extremely useful macros. THX a lot. PS: is it possible always to replace the current TOC if TOC applied once more? For TOC to update automatically. Try this macro which has an option to update the existing TOC, you stil need to run the macro though. 1. Would be perfect if TOC would update automatically as we add new headlines to the note. In terms of style I would prefer if TOC would appear on the side of the main content note like in wikipedia, or in the sidebar like ad-dons for Google Docs. - I agree, this would be perfect. 2. When you click a heading from the TOC, you are directed to the section, but the heading of the section is at the bottom of your page. Is it possible to be directed to the section, but change the settings so the heading is at the top and you can start reading instantly without scrolling? Would be perfect if TOC would update automatically as we add new headlines to the note. In terms of style I would prefer if TOC would appear on the side of the main content note like in wikipedia, or in the sidebar like ad-dons for Google Docs. Got "Invalid Pointer" recently in onenote 2016, but it works in onenote 2010. weird. But sometimes it just works fine. even weirder. I'm getting an error "Invalid Pointer" whenever I use this extension, It was working a month ago. First, thank you so much for the macro, it helps a lot. but back to top link is not working, when I click on it, it does nothing. I have to: first "copy link to paragraph" for the Heading title", and then edit "Back to Top" link and paste it there. Great Macro. Just what I was looking for! Generally like this TOC a lot! However one small problem - it will be nice if it ignores "(Back to Top)" portion of headings - as I like many other users in these comments have constantly changing pages and outlines. Is it possible to automatically updates the TOC as you write? I noticed that whenever I make changes to my notes, I have to recreate a TOC from scratch and erase the old one, which is annoying. are there any other plugin that could be used to automatically create a TOC in onenote? My OneNote pages are continually changing. So as I add and delete Heading1s, 2s, and 3s, I have to manually delete the TOC and then re-add it with the macro. When I re-add to TOC, it includes all of the "(Back to Top)" portions of each heading name. WHAT A VISUAL MESS. It makes it really hard for your eyes to cruise through a lengthy TOC. Even though that text is now officially part of the heading name, could you please update the macro to remove those characters from the TOC? Other than that, this macro is AWESOME! Incredible feature for long OneNote pages! Thanks a bunch. Very useful feature, thank you! Thank you for another fantastic article. The place else could anyone get that kind of info in such an ideal means of writing? I've a presentation next week, and I'm on the look for such info. Suggest installing your three TOC macros in one go. Thanks a lot for this feature. I hope you keep up the good work. So I guess by \"built-in styles\" you mean the quick-styles that come with One-note by default. You can choose quick-styles on the right click menu of selected text. If you try to set heading style of the text from the \"Custom Styles\" home tab button it doesn\'t work. The quick-style headings worked for me. I didn\'t see the FAQ where it\'s clearly explained that the .onestatic file extension must be associated with MacroInstaller.exe. Oliver, just double click on the downloaded file to install the macro. 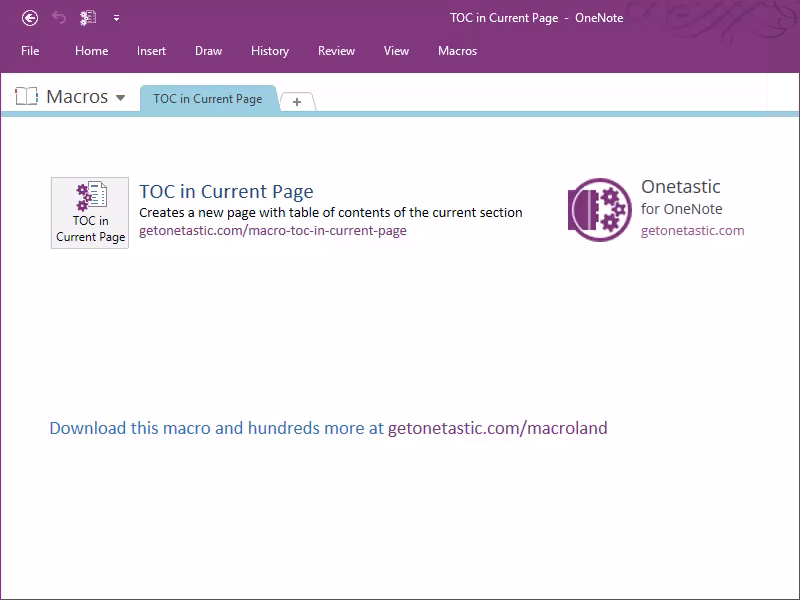 Your onenote extension is great, but it seems that we can not donwload Macros on this site. Every-time, for every macros, the file downloaded is not a xml, but a text file of 32 bytes with a hash-code. For this one for example, the file name is \"TOC in Current Page.onetastic\", but the content is 01C7C254D45E462CB24B3246853B3032. For the Upper Macro, the content is 0622BB0FF9C4416EA2E65BD264C86472. Tanks a lot if you could fix this ! jupp25: You need to have used the built-in heading styles for this macro to generate a table of contents. It will use the Heading1-6 styles to find items for the table of contents. the other TOC macros work fine, but this one doesnt for me. maybe I can try to solve it myself, but would be thankfull for any idea. Thanks Omar. It works brilliantly!